Unplug yourself in the Two Chimneys Cottage, is a beautiful cottage nurtured amidst the wooded slopes of Gethia near Nainital in Uttarakhand. Gethia is a small village located 5 km away from Jeolikote on the Haldwani - Bhowali Road. Well connected by road, the guest house is approximately 10 km away from Nainital town and is easily reachable. This cottage gives a warm and cosy feel of a typical jungle lodge in the woods. The lodge is a lovely combination of warm, personalized, home style service and is managed very professionally at the back end. It is enriched by nature with scenic surroundings, the manicured gardens, prompt and excellent service, finger licking good food all under one roof. The lodge is a boutique villa tucked in the verdure 10 km from Nainital amidst the lush woods of small village Gethia. The place is a sheer mine of fresh air, cool breeze, wooded slopes and silence. It is at a distance of 294 kms from New Delhi and is separated by 8.4 kms from Nainital. - The Study - has a fireplace and a private sit-out which offer breathtaking view of the valley. Well equipped with TV, Room Heater, Attached bathroom, Room service. - Olive - the room gets its name from the olive tree brought as a sapling from Italy. The room comes with TV, Room heater, Attached bathroom, room service, etc. - Goat Shed - the goats used to be tied here earlier so comes the name. The room doesn't has a TV but has Room heater, Attached bathroom, room service, etc. 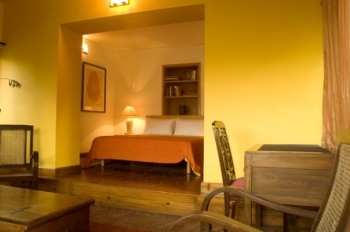 - First Things - This room comes with all wood and royal beds with a stunning loft with stand-up windows with a view of Nainital and the Deck. - Willow Suite - is a cosy bedroom which can accommodate two children with the sun pouring in and the cool breeze making its way. The room comes with TV, Room heater, Attached bathroom, room service. - Oak Suite - is a luxurious suite with a private lawn and a spacious room. The room comes with TV, Room heater, Attached bathroom, room service, etc. 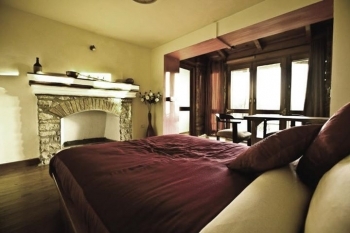 - Deodar Suite - is a spacious suite with a bedroom, attached bathroom overlooking verdant valley and a splendid loft. The room has Room heater, Attached bathroom, room service, etc. - Attach bathroom, 24x7 running water, Library, Swimming Pool, Power back-up, room service. The holiday home offers activities such as Bird Watching, Trekking, Swimming. - Room tariff is payable in advance to confirm bookings. - Check-in time is 2 p.m. Check-out time is 12 noon. - Extra Persons in room – Rs 1,500 each (inclusive of breakfast and extra bedding) (not applicable for The Study and Olive Room). - 75% if cancelled 2days or less in advance. - 50% if cancelled 9 to 3 days in advance. - 40% if cancelled within 14 days to 10 days in advance. - 25% if cancelled upto 15 days in advance. - 15% if cancelled prior to 16days of booking date. - Incase,there is a change in date of booking (depending on availability of rooms) 10% charge will be made. The bookings have to be honoured within 45 days of the original booking. - 25% if cancelled forty five days in advance. - 40% if cancelled thirty days in advance. - 40% if few of the total booked rooms are cancelled. - 80% if cancelled fifteen days in advance or later. By Road - Gethia village is well connected by metalled roads from New Delhi. The road is full of beautiful views throughout the journey from Kathgodam to Gethia. There are 2 routes â€“ first is from the Moradabad bypass following Rampur via Bilaspur, Rudrapur, Haldwani, Kathgodam and up to Gethia via Jeolikote. The other route Delhi is through Hapurâ€“ Garh Mukteshwarâ€“Gajuralaâ€“Moradabad bypassâ€“turn left after the bypass (to catch the Jim Corbett park route) then cross Tanda, Do Raha â€“ Bazpur-Kaladungi- Haldwani, Jewlikote and to Gethia. By Train - Kathgodam has strong connectivity to New Delhi and has numrous trains running on the route. One of them is Ranikhet Express which starts from Old Delhi Railway station at around 10.30 p.m and reaches Kathgodam (last station).by 5 a.m. You can hire a taxi from there to the lodge. By Air - The nearest airport is Pantnagar, about 70 kilometer from Gethia. It operates regular flights from Delhi to Pantnagar. From Pant nagar to Gethia is a comfortable two hour drive by taxis.